Active, Clean and Bountiful Rivers: The Wetlands BioBlitz Program – The Society for the Conservation of Philippine Wetlands, Inc. The Philippines is home to various types of wetlands. As an archipelagic nation with 36,289 square kilometres of coastline and about 749,917 hectares of inland wetlands alone – wetlands provide food, recreation, and livelihood to a large portion of Filipinos (DENR-PAWB, 2013). The Millenium Ecosystems indicated that global wetland loss and degradation continues faster than for other ecosystems. The Living Planet likewise emphasized that freshwater ecosystems are more threatened and are deteriorating faster than terrestrial or marine habitats. Laguna de Bay is the largest inland wetland in the country with a surface are of about 90,000 square kilometers. Approximately 100 rivers and streams drain into the lake, of which 22 are significant river systems. There is only one outlet, Pasig River through the Napindan Channel that drains lake waters to Manila Bay. Based on a 2011-2012 assessment of water quality of six major river systems, it was shown that although some of the sampling stations were able to pass the criteria for Class C waters stipulated in the DENR AO#34 (1990), these important bodies of water, in general, are in various stages of degradation. These rivers or river systems that were assessed included the following: Sta Rosa River System; Cabuyao River; Morong-Teresa River; Sapang-Baho River; Sta. Cruz River and Tanay River. The ecological integrity of Laguna de Bay is largely affected by the water quality of the rivers that drain into the lake. Considering the ecosystem services that could be provided by these wetlands, it is of great importance that communities affecting and are benefitting from these bodies of water are mobilized into action that will help protect them. ‘Bio’ means ‘life’ and ‘Blitz’ means ‘to do something quickly and intensively’. Doing this together make up a ‘BioBlitz’, a collaborative race against the clock to discover as many species of plants, animals and fungi as possible, within a set location, over a defined time period (usually 24 hours) (Robinson, L.D., et al., n.d.). The SCPW adopted the BioBlitz concept for wetlands and added dimensions that characterize the wetland including geographical, climate-related and ecosystem services as indicated in the Ramsar Information Sheet or the locally adopted Wetland Information Sheet, and called it the “Wetlands BioBlitz”. Among the specific outputs of this Wetland Bioblitz include Rapid Assessment on Wetland Ecosystems Services (RAWES), data on water quality, hydrology, fauna/avifauna, fauna, and flora. The context of the Wetland Bioblitz is to gather various stakeholders and sectors in the community, to work together in an informal and fun way to create a profile of the variety of living and non-living attributes of the ecosystem in a wetland area. It provides an opportunity for participants to learn together and share their expertise and enthusiasm for nature, particularly wetlands. This is a great and fun way of breaking down barriers to engagement with science and raising awareness on the role of biological and physico-chemical recording in wetland ecosystems. It also gives the local community an opportunity to contribute to a genuine scientific survey. 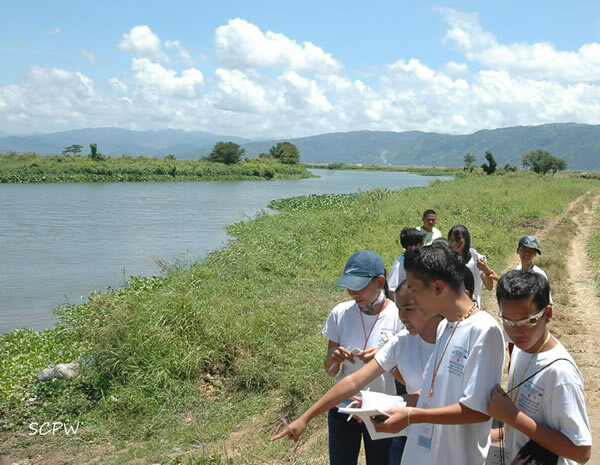 Wetlands BioBlitz or the WeBB will be implemented in other major rivers in Laguna de Bay Region. The platform for the activities of WeBB is the CLEAR Youth Network, a 1000-strong group of youth who, for more than 10 years have implemented lake conservation programs in their High Schools in 19 lakeshore towns of Laguna de Bay. The CYN Network through the SCPW will work with research and academic institutions, scientist and other volunteers to operationalize the program. The Wetlands BioBltz will facilitate characterization and monitoring of the improvement of rivers that are included in the program.